Today in our service, we are gathered to honor St. Joseph, the earthly father of our Lord, about whom we know so very little. Joseph has always gotten something of a short shrift in the Gospels. He’s not mentioned often – 18 times total, more than half indirectly; he never gets to speak … and then he disappears. •We know he was of the right lineage – Luke says he was of the House of David and a son of Heli, Matthew places him squarely in the lineage from Abraham to David to Jesus. •We know he built things, that he was a carpenter – Matthew and Mark tell us that, at times obliquely. •We know he lived in Nazareth – Matthew and Luke say he raised Jesus there, John says he came from there, a reference apparently made so that the disciple Nathaniel can disparage that mountaintop village. •We know Joseph was a righteous man – Matthew’s Gospel stresses that, both directly: Joseph was a “righteous man,” and indirectly, through the stories Matthew tells us. •And we know that when God spoke to him through God’s angel, Joseph was obedient. Three times, the angel delivered God’s instructions: Once when Joseph learned that Mary, his betrothed, was pregnant, and not by him; once when the angel told him to flee to Egypt, because Herod was on a murderous bend; and finally when the angel told Joseph it was safe to return to his homeland, that Herod was dead and the child entrusted to Joseph was safe. Three times, Joseph listened. Three times, Joseph obeyed. •Like Joseph, we, too, are of the right lineage, because we have been baptized into the Body of Christ, and thus are heirs of Christ’s eternal kingdom. •Like Joseph, we, too, are called to build — to build up the Kingdom of God in God’s very good creation. •Like Joseph, we, too, are called to be righteous people, to live in right relationship with God, to delight in God’s will and walk in God’s ways, not for our own glory, but for the glory of God who loved us into being. •And like Joseph, we, too, hear God speaking to us, giving us specific instructions that God asks us to obey. God has chosen us … God … has chosen … us … to carry out God’s dreams and God’s desires in God’s very good creation. God is speaking to us … through all of God’s various messengers … and asking us to listen. God is entrusting to us, God’s beloved children, the love and care of all of God’s beloved children, our brothers and sisters in Christ, who are related to us not by the blood of their birth but by the waters of their baptism. Take note, please, that the requests that God made of Joseph? The request to keep Mary, even though she was pregnant and not by him? The request to protect the newborn child, by fleeing to Egypt? The request to return to the land of Israel, so that the Scriptures could be fulfilled? All of these requests were hard ones. They were difficult. But they were not impossible. Refusing to set aside Mary even though the Law-with-a-capital-L said he should do so, to save his honor and punish her for her iniquity … that was difficult. If Joseph knew she was pregnant, you can be sure that others knew as well. His honor was on the line. The Law-with-a-capital-L was at stake. But Joseph listened to God, not to man, and did the right, the honorable, the loving thing. We are called to do the same: to do the right, the honorable, the loving thing. Fleeing to Egypt to avoid Herod’s troops? Who wants to leave your homeland, to be a stranger in a strange land, where you know you will be despised and treated poorly? But Joseph went anyway, in order to protect his wife and the child entrusted to him. We are called to do as Joseph did: To go to the place that God will show us and stay there as long as God needs us there. Returning home so that the Scriptures could be fulfilled? I suspect this one was not as hard, that after two years in a strange land, Joseph was more than ready to go home, so this one was probably not as hard, probably did not seem as impossible. 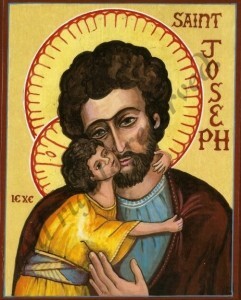 But regardless of the difficulty, Joseph obeyed. He took his family to Nazareth, which decades later would be derided by the disciple Nathaniel, apparently because it wasn’t such a great place to live after all, and certainly never had been mentioned as blessed or as the place from which the Messiah would come. And in this case, we, too, are called to emulate Joseph, to once again pick up our lives and go again to the place that God sends us, not necessarily to Nazareth but certainly to the place God needs us to be so that the Scriptures can be fulfilled. In honoring Joseph this day, my friends, we are making a commitment – a commitment to live lives of obedience and righteousness, a commitment to listen to God. Because God is speaking to us. God is telling us what to do: to live lives of wild, radical, inexplicable, inexhaustible love. We can debate how to do this until the cows come home, go out and come home again, but in the end, that’s what it all boils down to: Loving. Our call this day is to be more like Joseph, who heard and obeyed and worried not about how famous he would be, about what he might get in return for his faithfulness, and less like those who argue, who debate, who endlessly question what to do and why and how. I know Joseph gets short shrift in the Scriptures. He doesn’t get to say anything. He only is asked to listen, and then to act. But his actions speak louder than his words. My prayer for all of us this day is that we will become more and more like Joseph, that we will listen more and speak less, and then act upon the instructions God has given us, trusting that God indeed knows what God is doing. A sermon preached at the Diocese of Southwestern Virginia MDG Day 2011, 19 March 2011, on the Feast of St. Joseph, at St. John’s, Waynesboro, Va. There are times when our Lord Jesus Christ is trying to teach us something and to do so, he tells us a parable – and then he pretty much leaves us to figure out what the parable means in all its aspects, and we often end up … confused. This morning is one of those times. and not to lose heart, and then illustrates that command with a parable that at first blush seems to back up his instructions. Are we being told that God doesn’t answer our prayers unless we storm the gates of heaven, that God pays no attention to the first time, the second time, the third, the fourth, the fifth time we pray? Are we being told that God is like this unjust judge, who only gave in to the widow because he didn’t want a black eye (that’s the literal translation from the Greek of “wear me out”)? 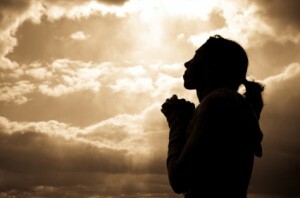 That God only answers our prayers in order to avoid being publicly embarrassed (as if that were even possible)? At first blush, those do seem to be the points of the parable. Thankfully, the parable is about neither of those points. This parable, my friends, is about the kingdom of God on earth. It is about God’s will being done. It is about God’s justice reigning in this world. Only by turning this parable over and focusing on the widow and what she does in the face of great injustice do we figure that out. You see, in the days when our Lord Jesus Christ walked the earth, widows had nothing. They had no rights – no right to speak in public, no right to property, no right to testify in a court of law. Everything their husbands owned went to the husbands’ male relatives. If those relatives didn’t like the widow, or were greedy and wanted everything for themselves, they could throw the widow out on the street, and there was little the widow could do about it. Because widows had no rights. They had no one to speak for them. No one to stand up for them. No social safety net. No women’s center. No pro bono lawyers – no one. The widow in this story? It’s obvious that she was all alone. There was no one was standing up for her. She wasn’t getting any justice from her husband’s family … that’s why she was going to the judge repeatedly. No one was taking her side – that’s why she argued before the judge alone. But even when that fool of a judge – and he was a fool, because he wasn’t even smart enough to fear God and he had no respect for anyone in the community – even when he refused repeatedly to hear her case and give her the justice that God demands, the widow refused to quit. She knew her rights, this widow, the rights that came directly from God. She knew that from the beginning and to the end of time, God was on her side. 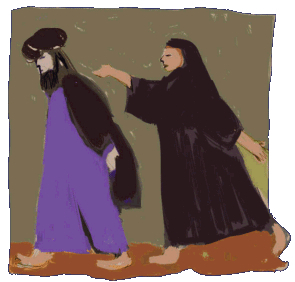 Throughout the Torah, the Law of Moses, God places special emphasis on caring for widows, orphans and strangers. Eleven times in Deuteronomy alone, God commands his people: Take care of the widows, the orphans and the strangers. So this widow knew: God was on her side. And no foolish judge was going to stop her from getting what God said was hers. Even when the odds are against us, this parable teaches us that we are not to stop working for God’s kingdom, for God’s justice, for God’s love, for God’s hope. Even when the kingdom seems out of reach, when there seems to be no justice in sight, or love to embrace, or hope to cling to, Jesus tells us to keep trying, to keep pushing. Because one day – one day – when enough people focus on God’s kingdom – and not their own; on God’s justice – and not society’s; on God’s inexplicable, eternal, wild, radical love – and not humanity’s limited, short-sighted, mean-spirited imitation of the same; when people embrace God’s incredible hope – and reject humanity’s hopelessness – when all that happens, God’s justice will roll down like waters and righteousness will flow like an ever-flowing stream. No matter how hard it seems, Jesus is telling us, no matter how hopeless it seems … do not quit. So why does Jesus tell us this in the context of a command to pray always? Because in Jesus’ scheme of life, prayer is more than simply asking for something. Prayer is about doing something. It’s about doing those things for which we pray! The Statue of Reconciliation, by Josefina de Vasconcellos. It sits amid the ruins of Coventry Cathedral, which was destroyed by German air forces during WWII. 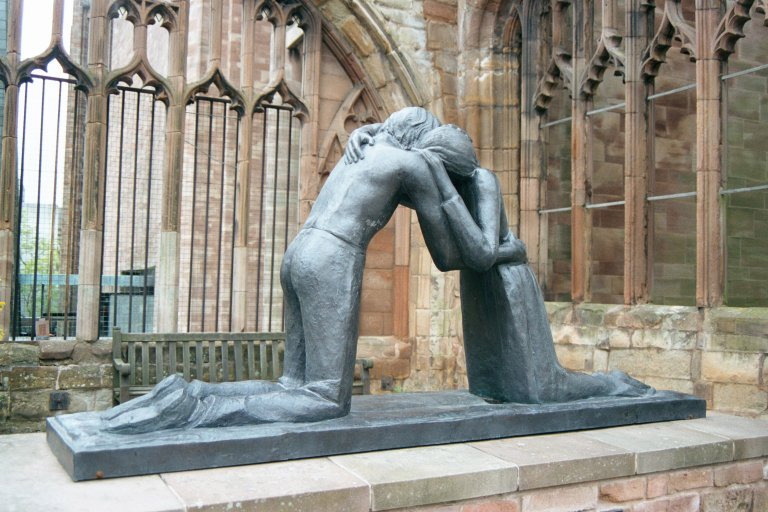 A replica of this statue was donated by the people of Coventry to the peace garden of Hiroshima. It is not enough to simply ask God for peace in this world. If we want peace, Jesus says, we’re going to have to work for it. We don’t have peace in this world because there are far too many people who reject it. Those of us who want it, who pray for it, Jesus says, are going to have to work for it. It is not enough to simply ask to God to watch over those in need this day. If we want people to have enough – not everything, but enough – we are the ones who are going to have to give them enough. This day! Jesus tells us this parable so that we can understand: We have to actively work for that for which we pray, even when it seems hopeless. Because in God’s scheme of life, there is always hope. There is always justice. There is always love. I know this. I have witnessed this. For four years I served as your missionary in Sudan, a war-torn nation where more than 3 million people have died in the last 40-some-odd years of war, and another 5 million people have lost their homes. At one point in Sudan, someone was dying – either in civil war or as a result of civil war – every 6 seconds. Every day, the people pray for peace. They’ve been praying for peace for decades. But they don’t simply ask God for peace and then sit around passively waiting for it. They work for it! Like the widow in today’s Gospel, they refuse to quit. The odds are against them, the world is pretty much ignoring them, their enemies are salivating over the chance to annihilate them. But they won’t quit working for peace. Right now – facing yet another civil war that is threatening the lives of nearly 10 million southerners in that divided land – they are working for that peace they so desperately desire. This very day, the Archbishop of the Episcopal Church of Sudan is in this country, seeking the help of the U.S. government and the United Nations, so that they don’t face yet another genocide come January, when South Sudan will vote on whether to become an independent nation. Every day, our brothers and sisters in Christ in Sudan, who are related to us not by the blood of their birth but by the waters of their baptism, not only pray for peace. They work for it. And this is our mission, too. To actively work for that for which we pray. Even when the world tells us it’s never going to happen. Even when the world conspires to stop us. Our mission is to never give up. Whenever we see an injustice, whenever we are encounter hatred, whenever we feel hope slipping away, Jesus says to us: do not quit. Do not give up. We are supposed to be like the widow in today’s Gospel: Always striving for God’s kingdom, for God’s justice, for God’s love, for God’s hope. God is depending on us. A sermon preached on the 21st Sunday after Pentecost, Proper 24, Year C, 17 October 2010, at St. Anne’s Parish, Scottsville, Va.
 Exodus 22:22; Deut. 10:18, 14:29, 16:11, 16:14, 24:17, 24:19-21, 26:12-13, 27:19. I am a rich person. I know this because I looked it up on globalrichlist.com, where I entered my income from last year and discovered that I rank in the top 13.74 percent of the wealthiest people in the world. According to this web site, I am the 824,785,999th richest person in the world, this out of the approximately 6.8 billion people now living. That is an amazing ranking, isn’t it? 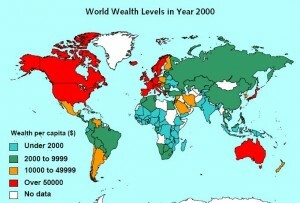 I was astonished when I found out how rich I am, when compared to the rest of the world. At the same time, I also am a poor person. 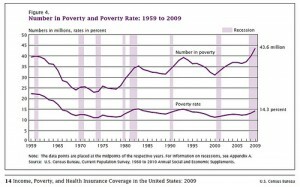 I know this because I looked in the Census Bureau’s Poverty Report that was released a few weeks ago. According to that report, I am incredibly poor. I am so poor that I inhabit, according to the Census Bureau, something called the “poverty universe,” along with more than 40 million other Americans. One report says I am rich. The other says I am poor. Let me clear this up for you a bit: For the last five years, I have been an Appointed Missionary of The Episcopal Church. I served for four years in the Diocese of Renk of the Episcopal Church of Sudan, and for about one year in the Diocese of Haiti. During that time, I was paid, by The Episcopal Church, $6,000 per year. $500 per month. I raised money during that time to help support me, so for both of those reports I consulted, I raised my income to $8,000 last year. On a worldwide scale, I am rich. In the “poverty universe,” I am poor. Somehow, I have managed to span the great chasm between rich and poor, the chasm of which Jesus speaks as he tells the story of the Rich Man and Lazarus in Luke’s Gospel. The story he tells is not a new one. It is, in fact, much older than Jesus himself, coming out of the Egyptian tradition. But regardless of its age and provenance, the story Jesus tells is an important one, not just for the disciples and Pharisees who are listening then, but to us now. Let’s get something straight right off the bat: Jesus – God – has no problem with wealth. We know that because the Bible tells us so. In this very story, Lazarus, the poor man who had been abandoned outside the gates of the unnamed rich man, is sitting next to Abraham, the patriarch of the people of Israel and indeed of the three great faiths of the world. Abraham was a very wealthy man, far beyond simply being rich. 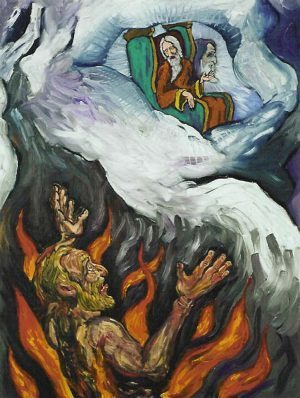 He had land, animals, money … By reading that Lazarus, a poor man in such bad shape that he was covered in nasty sores, so weak that he was licked by dogs (that most despised of animals), simply by reading that Lazarus is sitting in paradise next to Abraham, we know that wealth in and of itself is not a bad thing in God’s eyes. By hearing Abraham tell the rich man, “Sorry, you’re out of luck, Lazarus can’t help you,” we know that in God’s eyes, Abraham the wealthy man is also Abraham the exalted man. So wealth is not the problem that Jesus is highlighting in this story. What Jesus is focusing on is the great chasm between wealth and poverty, between those who have, and those who do not have. For it is that chasm that gets in the way of God’s will being done in God’s very good creation. I know a lot about this chasm. I knew a lot about this chasm before I went online and found out that I am simultaneously rich and poor. In my time as a missionary, I have lived among some of the poorest people on earth. I have seen the poverty, and I know what it is like to be on the wrong side of the chasm. In South Sudan, I lived in a mud hut, with no running water, very little electricity, lots of disease, limited food to eat. And I lived a life of privilege in Sudan, compared to the average person, who lived in a hut made of grass, who had no electricity ever, no clean water and no way to clean the water she had, frequently far too little to eat and no way to make enough money to ensure her children could grow up healthy and strong. I once had to explain to some U.S. government officials who wanted to learn what life was like in South Sudan that, no, there really was no functioning economy there, that most people were poor beyond belief, that there was never enough of anything, and no hope of getting any more. The Americans simply shook their heads in disbelief. Moses and the Prophets continuously spread God’s word: We are to care for the very least among us. You see someone in need, you help him. You feed the hungry. Give water to the thirsty. Make the lame leap for joy, the blind see, the deaf hear, the mute speak. Visit the sick and those in prison. Clothe the naked. Lord knows – and it is true, God truly does know – that there is a great chasm in this world between the rich and the poor, between the have’s and the have-nots. You and I know it, you and I have seen it, some of you and I have lived in it. But just because it exists does not mean we can’t do something about it. Rich or poor – or both, if you are like me – we can cross that chasm – in this life – and we can do something about it, if we so desire. In this country alone, more than 44 million of us inhabit what the Census Bureau now calls the poverty universe. More than 85 percent of the world inhabits that same universe. Is that what God wants? Are we willing to cross that chasm ourselves? The only way to answer that question is to figure out what exists in our lives that keeps that chasm there, and keeps us from crossing it. We may not want to cross it because the poor are too much like Lazarus, covered in ugly sores, so weak that the dogs – the dogs – are able to lick his wounds without hindrance. We may not want to cross the chasm because to do so would mean leaving our comfort zones, and we are afraid. We may not want to cross the chasm because we may feel, in our deepest secret places, that sometimes, the poor deserve what they have, or rather, what they don’t have. We may feel that far too many of the poor are poor simply because they refuse to work. Whatever reasons we may have for not wanting to cross the chasm, we have so many more for doing so. It doesn’t take much to become poor; we all know that. The economy in this country and around the world went from riding high to sinking like a lead balloon almost in the blink of an eye. We all know someone – and generally more than one someone – who lost their jobs, and then their savings, then their homes. Going from being a rich person to poor, which is so often outside our control, is frighteningly easy. In other words, one very personal reason for crossing the chasm is that because we could have been, and still might be, the ones on the far side, the ones who need help. We know, too, that while there is nothing wrong with being rich – however you define that term – there is something wrong, in God’s eyes, with not using our wealth to help others in need. We may not be in a position to join Warren Buffet and Bill Gates and all those other billionaires who are giving away half their fortunes, but surely we are able to give something to those who have less. And we may not be the ones who are called to work directly with the poor. Our call may be to use our wealth – however big or small – to help others help the poor. There is nothing wrong with that – each of us has different gifts, and some people’s gift is to fund the work of others. Whatever our gifts are, the important question we always have to consider is this: Do we want to cross the chasm? Because that surely is what Jesus is calling us to do today. 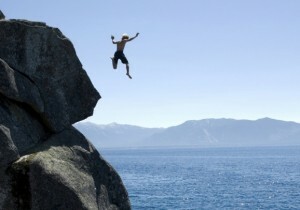 To make the leap of faith and cross the chasm. A sermon preached on the 18th Sunday after Pentecost, 26 September 2010, Proper 21 Year C, at Christ Church, Millwood. Did he really just say what we think he said? Did Jesus really just lavish praise on a thief, on a crooked manager, on a cheat? And did he really just instruct his disciples – did he instruct us – to live by sly cunning in order to get ahead? When you listen to Luke, it sure sounds that way. The Parable of the Dishonest Steward – that’s what this story is called. It’s also called one of the most problematic parables in the Gospels, because the message is mixed and makes us feel … uncomfortable. It’s the story of a steward, a manager of a rich man’s estates. The rich man hears that the steward was cheating him … we don’t know exactly how, other than the fact that the steward was squandering his master’s property. The rich man is royally upset by these reports – for who wants to hear that someone you trusted, somebody you put in power, is wastefully throwing away your money? So the steward thinks for a while, and then he goes right back to what he’s been doing all along: He becomes extravagant again. So he asks the first person he calls in: “How much do you owe?” The peasant says, “One hundred jugs of olive oil.” Now, my friends, you know that olive oil is expensive, right? Good olive oil runs up to six times what regular vegetable oil costs. So if this man owes 100 jugs of olive oil – gallons and gallons of it – he’s probably in hock to the master for the rest of his life! He’s an indentured servant and owes everything – every teeny, tiny thing of his life – to the rich man. There’s no way he can get out of this debt – because that’s how the system was designed. And what does the steward do? Does he demand payment? No. Does he threaten the man (which is probably what the peasant was expecting; after all, this steward is the rich man’s representative, which gives him life and death power over the peasant …)? So does he do that? No. In order to make his own life better, in order to make the peasants who probably have feared him forever now think better of him, perhaps even like him, the steward acts extravagantly, forgiving their debts by slicing them down to size. But by cutting each person’s debt to a reasonable size, by forgiving the outlandish portions of those debts, the steward makes the rich man look good. He makes himself look good. His own future suddenly looks good again, too – remember, the rich man ends up praising the steward. All because, in sheer desperation, out of unbridled terror and unremitting pride, the steward forgave debts. It’s important here to step back a bit and examine what this means to Jesus. Before Jesus told his disciples this parable, he taught them how to pray. 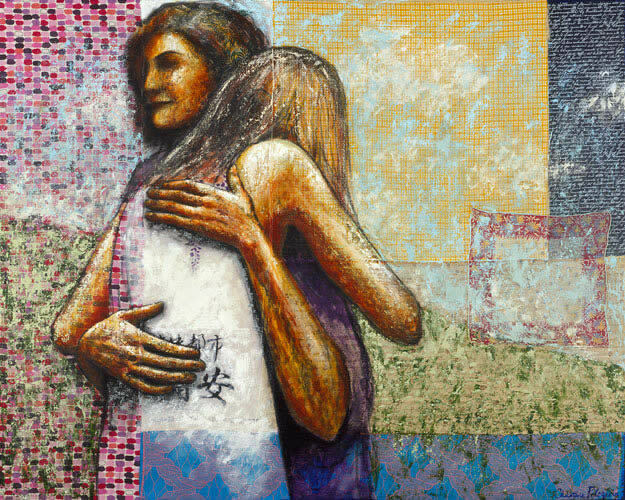 In what we now call the Lord’s Prayer, Jesus teaches us to say, “Forgive us our sins as we forgive those who owe us.” Translated another way: As we forgive everyone who is indebted to us. This is not how we translate the prayer. 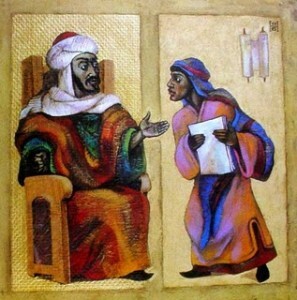 In the King James Version, we say, “Forgive us our trespasses, as we forgive those who trespass against us.” And in the so-called “modern” translation, we say, “Forgive us our sins, as we forgive those who sin against us.” But neither translation is accurate, for in both Matthew and Luke’s gospels, Jesus says, “Forgive us our sins as we forgive those who are in debt to us.” Jesus balances our sins against others’ debts … So Jesus is telling us, right in the prayer he taught us, that we are to forgive debt. Which is exactly what the steward did: He forgave debts. It doesn’t matter, Dylan says, how the steward got to that forgiveness, or even why he forgave. It doesn’t matter that he was only forgiving a portion of the debt, or that the debt wasn’t even owed to him. What matters is that he forgave. That is what Jesus wants us to do: Forgive. Jesus tells this parable, and praises this steward because, even though the steward did it for all the wrong reasons, he still showed mercy. He still forgave people. And forgiveness is key to how we are called to live as disciples of Jesus. Not to hold on to debts, but to let them go. How many times have we been in situations where a little forgiveness would go a long way … and we didn’t do it? And the situation got worse? How many times have we been in situations where we didn’t feel in the least inclined to forgive, but we did so anyway, even just a little, with only half our hearts, and life was better, for us and for the people we forgave? Jesus is very clear about this: We are called to be extravagant in our forgiveness. To squander our forgiveness. To scatter it hither and yon, when we want to, and when we don’t want to. It simply does not matter how we get to forgiveness. It does not even matter why we forgive. … we are called to forgive. With as open a heart as we can muster, at that given moment, with that particular person. There’s a reason Jesus tells this particular story; there’s a reason Jesus showers praise on the steward. Not because he was the best example out there. But because even though he was a lousy example … he was dishonest, he wasn’t paying attention, he squandered his boss’ money … even though he wasn’t someone we want to emulate ourselves, he still managed to forgive. And if someone as incompetent and dishonest as this steward can manage to do this, Jesus says, how much more can we – we who are his disciples, we who are children of the light – how much more can we forgive? If the steward can be extravagant in his forgiveness, for all the wrong reasons, how much more can we be extravagant in our own forgiveness, for the right reasons? Even in the darkest of times, we who are children of the light are always called to forgive, and to do so extravagantly. That’s really what Jesus wants to teach us today. * I am deeply indebted to Sarah Dylan Breuer’s exegesis, found sarahlaughed.net, http://www.sarahlaughed.net/lectionary/2007/09/proper-20-year-.html, and http://www.sarahlaughed.net/lectionary/2004/09/proper_20_year_.html. A sermon preached on 19 September 2010, Christ Church, Millwood, Va. It would be so much easier this morning if we were listening to Matthew’s Gospel, wouldn’t it? The Gospel where Jesus, pretty much in the same setting, says, “Whoever loves father or mother more than me is not worthy of me; and whoever loves son or daughter more than me is not worthy of me”? But we don’t have Matthew this morning, with its emphasis on love. No, we have Luke. And in Luke’s Gospel, Jesus is not as gentle, not as nuanced, not as loving. At best, when we hear Jesus say this, we cringe. At worst, we ignore him. Because hate is not something that we associate with Jesus. 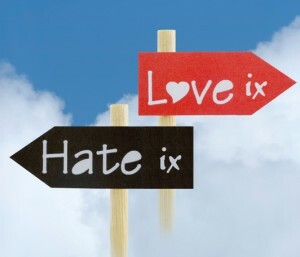 When I work with children and youth, I always stop them from using the word hate. You know how kids can be: I hate … broccoli. Or I hate my teacher … or that TV show … or that song. Kids use the word hate all the time. And when they do, I stop them. “You can’t use that word,” I tell them. “Jesus doesn’t tell us to hate things, so you can’t hate. You can despise. You can even severely despise. But you cannot hate. God did not create us to hate. God created us in love to love,” I tell them. We are created in God’s image, and that image is, first of all, one of love. We know that because we are not necessary to God. God is necessary to us, but we are not necessary to God. And we know that because God was before we were, and God will be after we are, so therefore we simply cannot be necessary to God. So God must have created us because God wanted us, God desired us. Which means God created us out of God’s love for us. Which is why we simply can’t go around hating things, hating ideas, hating people. It simply is not how or why we were created. But then we come to Luke’s version of Jesus’ saying, where Jesus is not gentle, not nuanced, not loving. What brought this on? Where did this come from? Well, I’ll tell you: I think Jesus has had it. 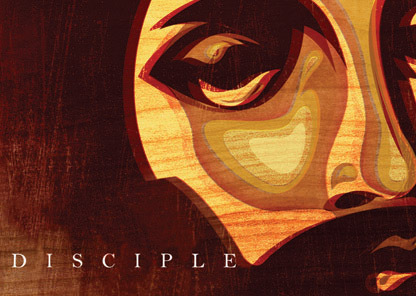 I think he’s tired of explaining to people – high and low – what it means to be a disciple. I think he’s tired of having large crowds follow him, without making any commitments. I think Jesus knows that far too many people in the crowd were just along for the ride, wanting to see what would happen next with this young, itinerant rabbi from Nazareth who preached a radical message of God’s love and hospitality. Remember, these are people who have been waiting for a Messiah for centuries. They wanted another David. They wanted Israel and Judah restored. They wanted the Romans out, their glory restored, their freedom back. Not that they were planning on doing anything about it. That’s simply what they wanted. So when Jesus showed up in their neighborhood, they followed him, just in case anything happened. And I think, by this point in his ministry, Jesus has had it. He’s fed up with the freeloaders. The only way to be my disciple is to hate everything else. Now, to be clear, the way Luke uses the word hate is somewhat … slightly … different from the way we use that same word these days. And here I’m not talking about how some people use the word hate, like the kids in Youth groups do when they say they hate broccoli, or that TV show, or that song. That is not the “hate” that Luke is describing in today’s Gospel. What Luke is talking is the disruption of the family in first-century terms. Hate here means disconnecting from everything that has previously defined a person: family, friends, genetics … As one commentator describes it, when Jesus says to hate your family, he means to turn your back on the old ways of life, the old world as people in those days understood it, so that the new ways, the “new world of God,” can come into being. So, you see, Jesus looked back and he saw all those hangers-on, all those free-loaders who were just along for the ride, who were following him to see what would happen next, but who would do nothing to make that next thing happen … he saw them, and he cut loose. Because nothing – nothing! Jesus says – can come between you and God. That’s what it means to follow me. Not just traipsing across the countryside, waiting to see what happens next. Not just showing up when I preach, or coming to me when your need is great and you want to be healed. No. You want to be one of my disciples? Jesus says. Put God first. Every moment. Every day. In everything you do. Jesus is being very clear: We are not created to be freeloaders in our faith. We are not created to simply follow along, so that we can see what happens next. We are created to make the next thing happen. We who are created in God’s image, out of God’s love, are the ones who are called to love in return. To feed the hungry and care for those in need … not “God on high,” not the “other guy around the corner” but us. It is up to us to make the next thing happen through our love … like your food pantry yesterday … and the Stop Hunger Now program this coming Saturday … and the FISH clothing bank this whole month. We are the ones who are called to see the world’s needs about us, and do something about it, to change it … like this discussion that you are having about the possibility of nursery school here for that 40 percent of the children in this county who never have a chance to go to preschool. This is what it means to be a disciple of Christ: We have to turn our backs on everything old, everything that defines us by society’s limited and often self-serving standards, so that everything new, everything that is God, can come into being. And the only way that is going to happen is if we refuse to be the hangers-on and the freeloaders, just along for the ride, and instead actively decide to put God first … in every moment and every part of our lives. Jesus is stunningly clear: Discipleship is not easy. Discipleship is not cheap. Being a disciple means that we have to be brave and stand up for what God wants, regardless of what society tells us. And it means that sometimes, yes, we are going to have to hate, just as Jesus said – not in the visceral, evil way that we encounter so much in today’s world, but in the back-turning, decision-making, world-changing, radical way of which Jesus speaks in Luke’s Gospel. Because that is the only way we can change the world. A sermon preached on the 15th Sunday after Pentecost, Proper 18, Year C, by The Rev. Lauren R. Stanley at Christ Church, Millwood, Va.